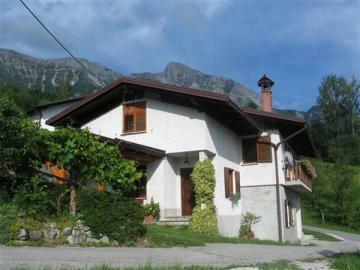 The Žvanc( farm is located in Drežniške Ravne above Kobarid, with a beautiful view of the Soc(a Valley. All the food prepared at the farm is home-grown as well as homemade, including vegetables, milk products, freshly baked bread, meat products (including sheep and goat), various casseroles, and delicacies such as štruklji. Local customs are well known here, and visiting during the Lent Carnival week is quite special. The Korens also operate a campground that can accommodate 120 campers eight kilometers from the farm on the Soca River. In general, vacations at the Žvanc( farm are active, related to mountains and water. Go fishing, rafting, or kayaking on the Soc(a River or ride along it on bicycle. The farm is an excellent starting point for hikes of two to eight hours (the Kozjak waterfall is especially worth seeing), and a takeoff site for paragliding over the Soca Valley is only two kilometers away. Canoeing and rafting are the main activities for all the campsites along the Soèa, but here there are many opportunities for cycle tours, paragliding, enthusiasts can choose to take off from Kuk, Planica or Stol, and the campiste is an ideal base for tours to the mountain peaks and also for simple family walks, as it lies on the Kobarid history trail.